DealDash is an amazing website with the newest technology. DealDash has exactly what you need to keep up with the latest and greatest electronics. One of the most popular categories on DealDash is the Electronics and Computer category. If you need a new laptop for work such as a Microsoft Surface Pro, DealDash has that! Maybe your passion is video games and you need a new Dell gaming laptop, DealDash has that, too! DealDash has a nice selection of laptops, iPads, and video game systems up for bid in the Electronics and Computer category. If you’re a big fan of the Samsung brand, then you won’t be disappointed by Dealdash‘s Electronics and Computer Category. DealDash has many Samsung products for you to browse and bid on. DealDash carries the Samsung Galaxy S7, Samsung Galaxy S7 Edge, Samsung Galaxy Tab 2, and even the hottest Samsung technology – Gear VR! Speaking of cell phones, if you have a smartphone you need to download the DealDash app. You can buy bids, bookmark auctions so you can come back to them later, set or remove BidBuddies, and of course bid on auctions! It’s very convenient to be able to DealDash while on the go. DealDash is the first place to check when you need new electronic equipment. If you happen to be reading this blog on your iPad or smartphone you can click on this link to go to DealDash and bid that way – but it’s really not optimized for the mobile experience, that’s why you should use the app, instead. It has a much better layout and easier to use interface for DealDashing on the go. DealDash is now offering product reviews on each item’s page. When you are thinking about getting a new piece of electronic equipment it’s very important that you read the reviews before you make a big purchase. Isn’t it wonderful that DealDash has taken care of that for you? Here’s a tip – scroll down to the bottom of each auction and you will see the product reviews for that particular item. If it’s time for you to get a new piece of electronic equipment, then it’s time to visit DealDash! You can browse the auctions, do a search for a particular item, and bid, bid, bid! Good luck and happy bidding everyone! DealDash has sports products for everyone in the Hobbies, Toys, Outdoors, and Games Category. Let’s see what we can play with DealDash! The DealDash Hobbies, Toys, Outdoors, and Games category has a ton of great sports products up for auction. For starters, they have bikes for the whole family – Mom, Dad, the kids, and even Grandma and Grandpa! What’s better than a bike ride around the neighborhood with the whole family? If you need a bike for one (or all!) of the members of your family, then you need to check out DealDash’s Hobbies, Toys, Outdoors, and Games category. DealDash also offers many different varieties of exercise equipment. If you’re looking for a fun, healthy new exercise hobby, DealDash has the equipment that you need! DealDash offers treadmills, stationary bikes, rowing machines, and even yoga supplies such as yoga mats and yoga balls. Starting an indoors exercise program now is a great idea, the winter is the perfect time to use exercise equipment. Start now, be fit by the summer time. Finally, another favorite in DealDash’s Hobbies, Toys, Outdoors, and Games category are trampolines. DealDash has been offering trampolines in different sizes for a while now. I haven’t been lucky enough to win one yet, but if you or your kids would enjoy a trampoline in your yard, check out Dealdash‘s Hobbies, Toys, Outdoors, and Games category. If you’re more into indoor activities and gadgets than sports, have you had a chance to download the DealDash app? If you’d like to bid on any of the thousands of DealDash auctions the app can help you snag an auction if you aren’t near your computer. You can buy bid on auctions, set reminders, set or remove BidBuddies, and even change your profile picture. The DealDash app is simple and fun to use. Thanks for reading the blog today, we appreciate your time and your thirst for DealDash knowledge. Just click on this link to go to DealDash to browse auctions, set BidBuddies, bookmark auctions, and more. Now go visit DealDash and see how much you can save. Good luck and happy bidding everyone! DealDash has many new products in the Fashion, Health, and Beauty Category. Let’s see what DealDash has to offer this week! The DealDash Fashion, Health, and Beauty category has a lot more than just clothing and bathroom products up for auction. For starters, they have some beautiful jewelry. Jewelry on DealDash is a fairly new occurrence. I remember a few years ago they would occasionally offer a bracelet for auction, but lately they have had bracelets, ear rings, and necklaces up for bid. If you (or your wife or daughter) love jewelry, then you need to check out DealDash’s Fashion, Health, and Beauty category. DealDash also offers many different varieties of watches. If you’re looking for a fun, colorful, and unique silicone watch DealDash has it! DealDash also offers more refined choices for both ladies and men that are suitable for wearing to work or out for a night on the town. Occasionally, DealDash also offers smartwatches. If you’re in the market for a smartwatch keep your eye on the auctions and be sure to snag one when it’s offered. Finally, another favorite in DealDash’s Fashion, Health, and Beauty Category is purses! DealDash has recently been offering lady’s purses as well as gender neutral laptop bags, backpacks, and messenger bags. Dealdash‘s Fashion, Health, and Beauty Category is the first place that you should look if you’re looking for a new bag. Have you downloaded the DealDash app yet? If you’d like to bid on any of the new items on DealDash the app can help you snag an auction if you’re out and about. You can buy bids, bookmark auctions so you can come back to them later, set or remove BidBuddies, and of course bid on auctions! Winning an auction on the DealDash app is easy and fun. Thanks for reading the blog, and if you happen to be reading on your iPad or smartphone you can click on this link to go to DealDash and bid that way – but it’s really not optimized for the mobile experience, that’s why you should use the app, instead. It has a much better layout and easier to use interface for DealDashing on the go. Now go visit DealDash and see how much you can save. Good luck and happy bidding everyone! DealDash knows what the latest and greatest products and trends are – and they have all of them up for auction. Everyone has different hobbies and interests, and DealDash has you covered on just about any hobby or interest that you can think of – just take a peek at some of these fresh and new products that DealDash offers. They are trendy and hot right now, and DealDash has them for you. Drones – DealDash has drones for different budgets and applications. They offer up some of the less expensive styles that are great for kids and adults to fly together, and they also offer some of the more high tech expensive drones that are for the serious drone-flyer. Drones are really hot right now, and DealDash has had them since they were just starting to gain popularity. Ultra HD TVs – TVs just get better and better. It seems like every year they come out with a new incarnation of the “best” new TV that it’s imperative that you must buy to get the ultimate viewing experience. Well, no matter what new style of TV is being touted by the experts, DealDash has what you need. LED smart light bulbs – The new LED smart bulbs are one of my new favorite products. As always, DealDash is there to offer auctions on the latest and greatest products. If you’ve never used an LED smart bulb, you are missing out. You can control every aspect of lighting with an app on your phone. 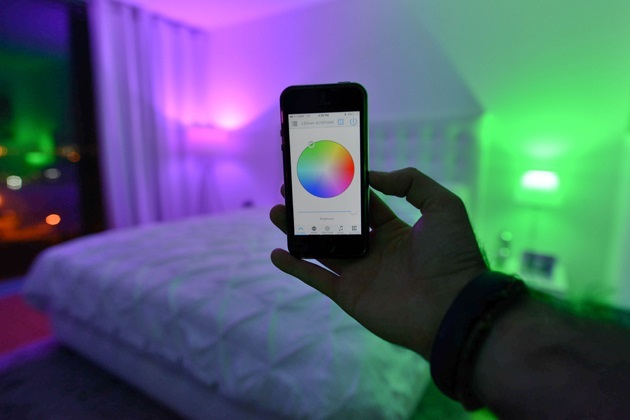 You can change the color of the bulb, set timers, change the tone of the room, and some of them are even MP3 speakers! Just leave it to DealDash to offer up the best and newest products for us to try. Speaking of things to try out – DealDash now has an app! The DealDash app is a real time-saver. It’s very convenient to be able to check DealDash auctions from anywhere on the go. You can also buy bids, bookmark auctions so you can come back to them later, and set or remove BidBuddies. If you frequent DealDash on your phone you should definitely get the app. It’s free from both the Google Play store and the iOS App store. Now that you have downloaded the DealDash app go check out the auctions. Just use your quick and easy access to DealDash on the go and win, win win! It’s easy and fun to win with the DealDash app. Good luck and happy bidding everyone! DealDash is always on the cutting edge of what’s new in technology. They always have the newest and greatest items for techie’s everywhere. If you’re interested in the newest incarnation of the iPad or any other Apple product, or if you’re interested in the latest PC laptop or Android phone, DealDash has you covered. DealDash was born in the technology age, it was founded in 2009, a mere 7 years ago. A lot can change in 7 years, though – 7 years ago Twitter was a relatively unknown site, Windows 7 was launched, satellite navigation was implemented on smartphones, and people really started downloading apps – more so than ever before. Here we are, 7 years later – Twitter has absolutely exploded in popularity, we are now on Windows 10, we all got through the comically horrible Apple Maps update, we have all embraced Google Maps as the holy grail of satellite navigation, and on the app front…DealDash now has an app! The DealDash app is great! It’s nice to be able to check DealDash auctions from anywhere! You can also buy bids, bookmark auctions so you can come back to them later, and set or remove BidBuddies. It’s awesome to be able to DealDash while on the go. Aren’t you glad that DealDash likes to keep up with technology? If you’re reading this blog on your iPad or smartphone you could simply click on this link to go to DealDash and bid that way – but it’s really not optimized for the mobile experience, that’s why I recommend that you use the app, instead. It has a much better layout and easier to use interface for DealDashing on the go. Now that you have downloaded the DealDash app you’re ready to be a winner, even when you’re not at home in front of your computer. Just use your quick and easy access to DealDash on the go and win more auctions. It’s easy and fun to win with the DealDash app. Good luck and happy bidding everyone!